Speaking of Spicer as we all seem to be, Peter Gizzi's "Jack Spicer, Bruce Conner and the Art of the Assemblage" is online at Sienese Shredder. One of the illustrations in the essay, reproduced here, is a nicely back-handed homage to Poetry - a take on the magazine's Fifties and Sixties look and in particular Juliet Rago's (Henry's daughter) version of Pegasus - that served as the cover art for Spicer's Book of Magazine Verse (White Rabbit Press, 1966, designed by Graham Mackintosh and Stan Persky). 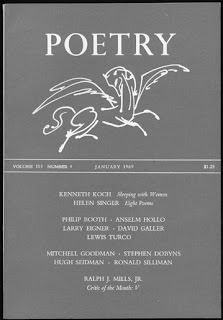 For comparison, I've posted an image of an actual Sixties-era Poetry magazine cover, from an issue featuring one "Ronald Silliman." Sharedon, this isn't the same Graham Mackintosh who circumambulated Baja, is it?! But then, how many could there BE...?